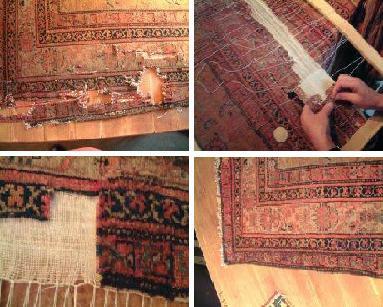 Oriental rug repair and restoration is very skilled and precise work and can be a labour intensive process. 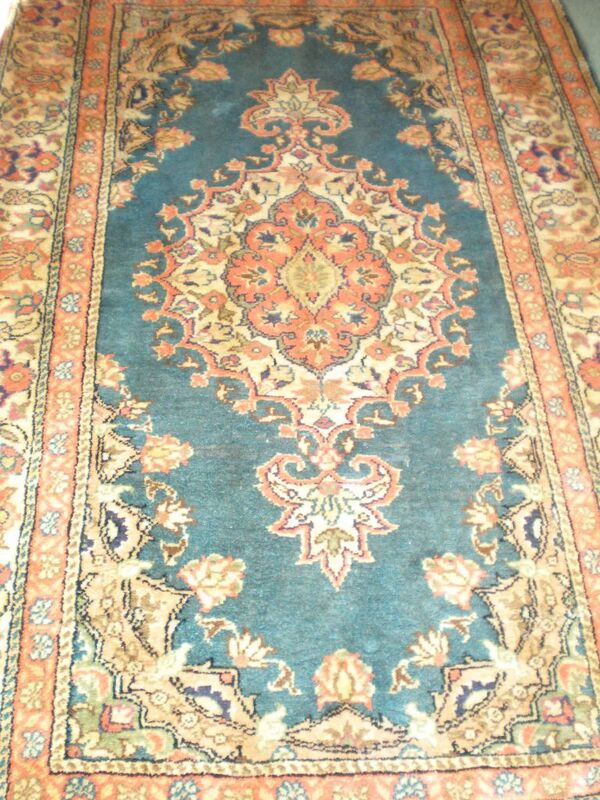 Our skilled master rug restorers have the expertise and experience to repair all damaged rugs having worked internationally on a wide variety of different rugs. Our workshop is fully equipped to carry out all rug repairs on all types of rugs regardless of the original fibres, their size or whether hand or machine made. We select the correct colour yarns from stock or import in, in order to obtain the best colour match for invisible repairs. 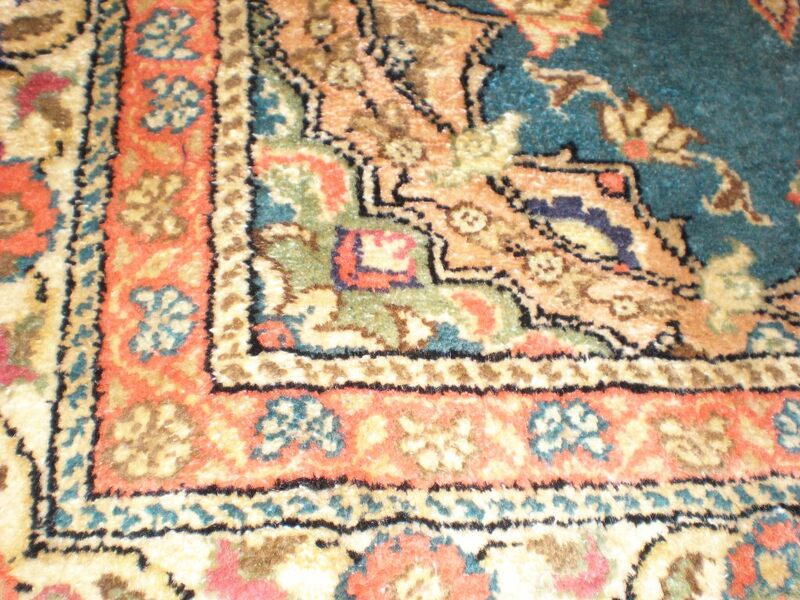 From fringes and sidecords to the complete restoration where holes or sections of the rug need rebuilding and repiling, all rugs are repaired by hand using many of the same traditional methods employed by the original rug weaver. 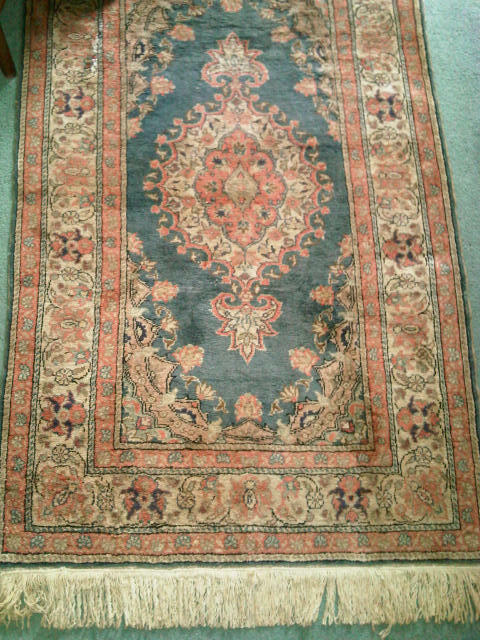 We can also resize, and re-fringe and secure rugs and runners. All rugs must first be cleaned prior to any repairs being undertaken in order to get a correct colour match for all of the new wool or silk. 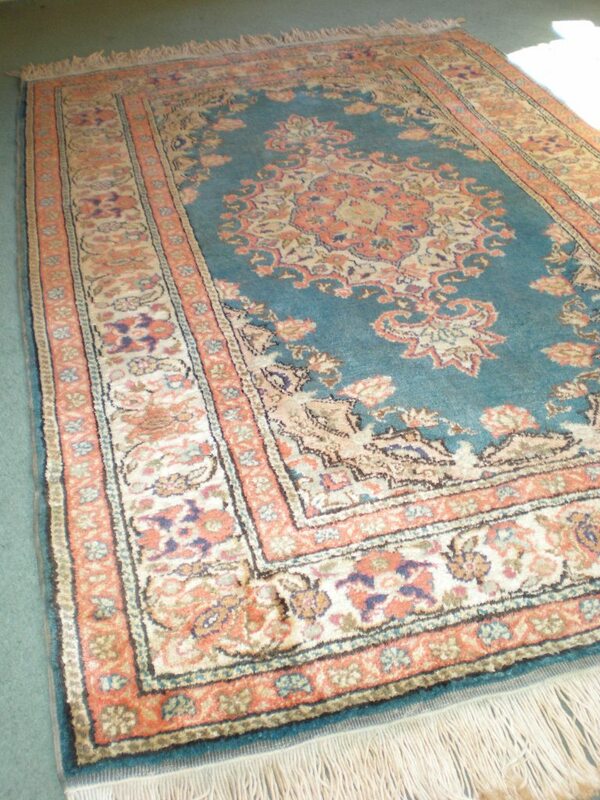 Clean rugs also make repairing easier as the yarns are softer and more pleasant for our restorers. In the first instance, Contact us to advise you and for a FREE repair appraisal and quotation. We may ask you to send us high quality pictures of the damage requiring repair to help us give you an accurate quotation. Home visits can be arranged depending on location. Brief: Deep clean and repair and re-secure the fringe. The deep clean has revived all colours and lifted the flattened pile. 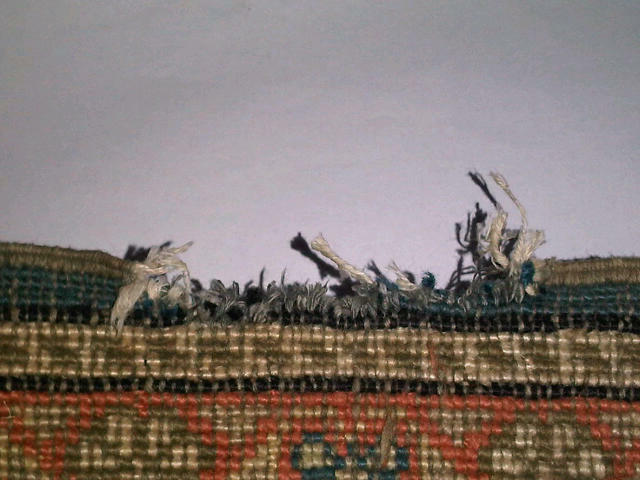 Repairing and securing the entire damaged fringe will prevent any further fraying and loss of knots/pile to the body of the rug to give many more years of service. 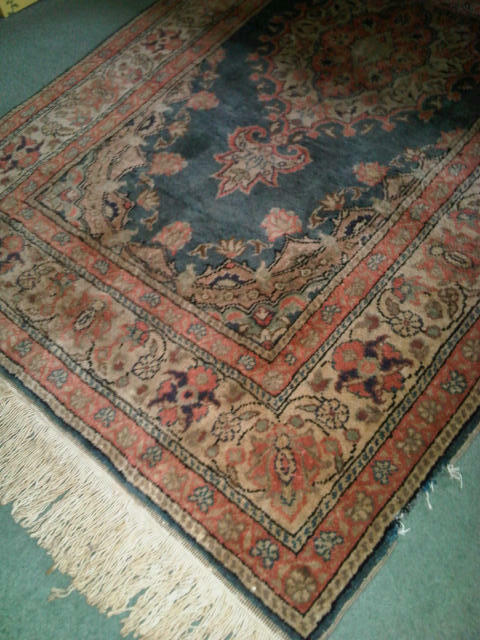 Brief: This rug needed a number of repairs to the sidecords and the pile rebuilding plus a thorough wash and refresh as it had been stored for many years. All traces of moth will have been removed during the cleaning process but for extra piece of mind for the future we moth treated it during the cleaning process with our moth proofing treatment. Top tip: Regular hoovering front and back of the rug and lifting the rug occassionally will help prevent any future moths settling in and eating the wool. We can flatten the edges or corners of a rug that curls up. Curling usually occurs because the tension of the foundation of a rug was not quite right when it was made and it often occurs in finer, tightly woven rugs. Also water coming into contact with a rug can cause shrinking and therefore curling. 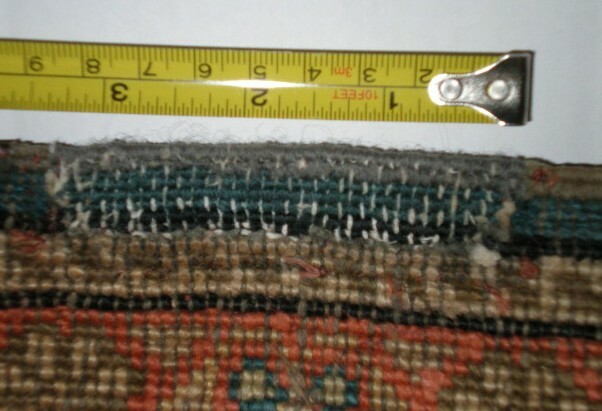 To rectify the curl, the rug is stretched and pinned to a board when wet and air blown up through the rug from under the board to dry the rug. 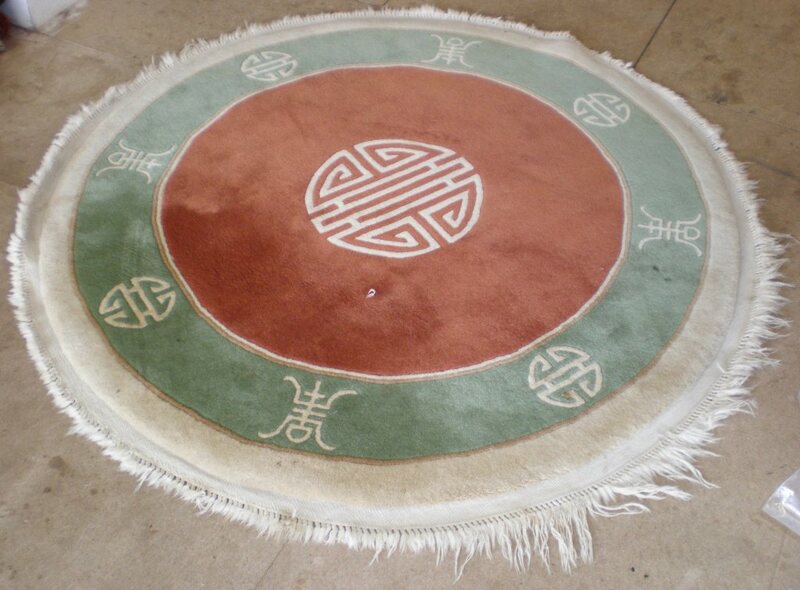 Once dry the rug is unpinned and should now lie flat. The process can be repeated if necessary. 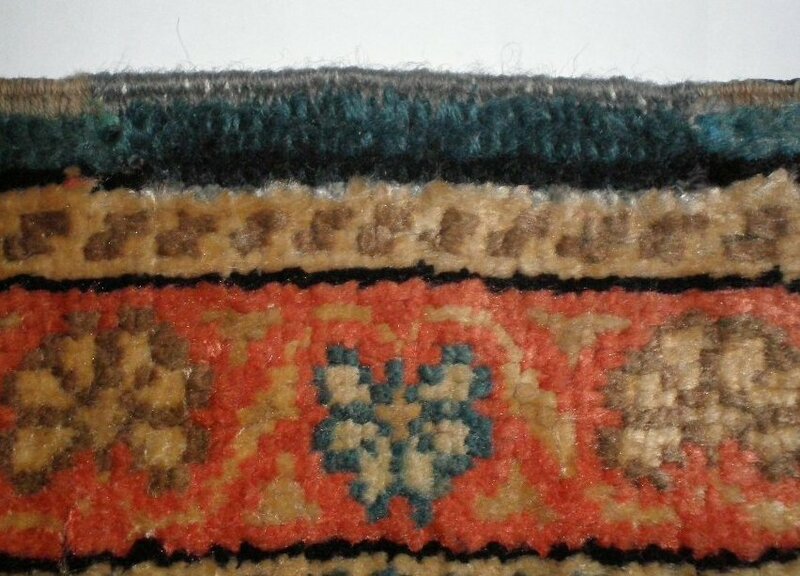 Alternatively a strip of webbing (often leather) can be stitched onto the reverse of the rug, along the side edge that is curling, to stretch and hold the rug taught to correct the curl. 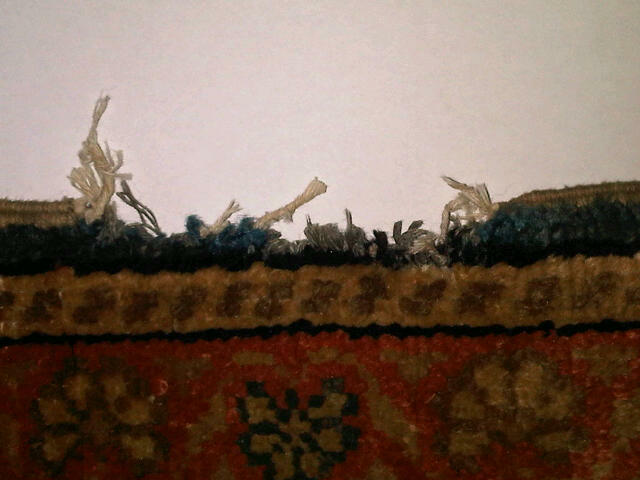 Have you got a more specific rug repair issue? Get in touch and we'll use our many years of experience to help. 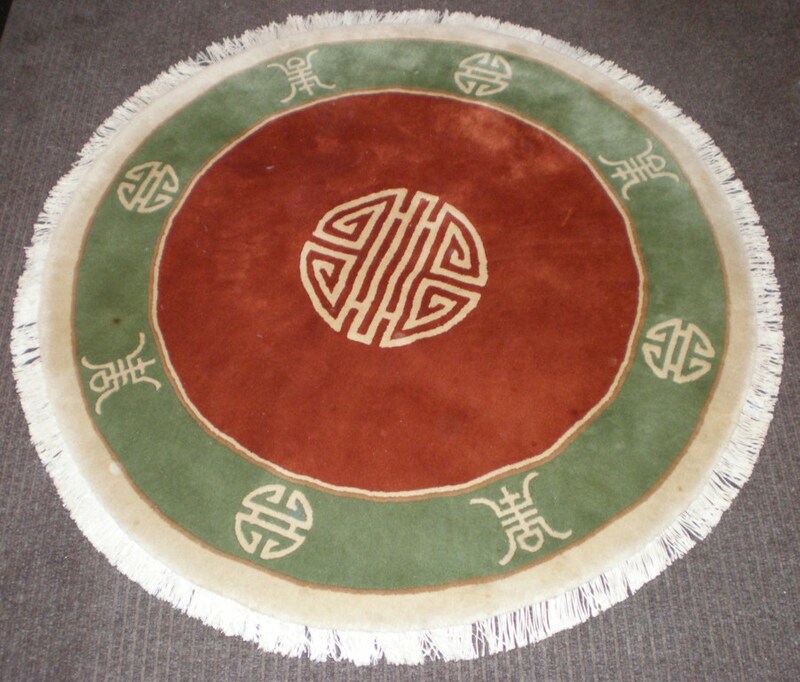 We offer specialist rug repair and restoration for all types of rugs & fabrics - large or small - Oriental, Modern & Contemporary Rugs - Hand Made & Machine Made Rugs - Antique Rugs - Silk Rugs - Persian Rugs - Afghan Rugs - Turkish Rugs - Pakistan Rugs - Chinese Rugs - Indian Rugs - Kilims - Needlepoints - Tapestries - Sisal Rugs - Seagrass Rugs etc. We cover Wiltshire, Oxfordshire, Berkshire, Cotswolds, Hampshire, Dorset, Gloucestershire and the Bristol/Bath area. Call us to see if we cover your area and receive a FREE no obligation quote.